Rosacea is effectively treated using the Lumenis One IPL. This may require several treatments. • What does rosacea look like? • How are the eyes affected? • Can rosacea be cured? • What can people with rosacea do to help themselves? Rosacea is a long-term disease that affects the skin and sometimes the eyes. Its symptoms include redness, pimples, and, in later stages, thicker skin. 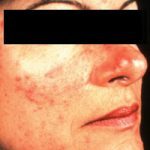 In most cases, rosacea only affects the face. About 14 million people in the United States have rosacea. This disease is most common in: Women (especially during menopause) People with fair skin Adults between the ages of 30 and 60. Sometimes starts before aged 20. Frequent redness (flushing) of the face. Most redness is at the center of the face (forehead, nose, cheeks, and chin). There may also be a burning feeling and slight swelling. Small red lines under the skin. These lines show up when blood vessels under the skin get larger. This area of the skin may be somewhat swollen, warm, and red. Constant redness along with bumps on the skin. Sometimes the bumps have pus inside (pimples), but not always. Solid bumps on the skin may later become painful. Inflamed eyes/eyelids. A swollen nose. In some people (mostly men), the nose becomes red, larger, and bumpy. Thicker skin. The skin on the forehead, chin, cheeks, or other areas can become thicker because of rosacea. How Are the Eyes Affected? Up to 50 percent of people who have rosacea get eye problems. Eyes can have redness, dryness, itching, burning, excess tears, and the feeling of having sand in the eye. The eyelids may become inflamed and swollen. The eyes may become sensitive to light, and the person may have blurred vision or some other kind of vision problem. 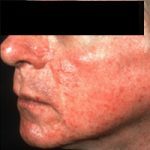 Doctors don’t know the exact cause of rosacea. Some doctors think rosacea happens when blood vessels expand too easily, causing flushing. People who blush a lot may be more likely to get rosacea. It is also thought that people inherit the likelihood of getting the disease. 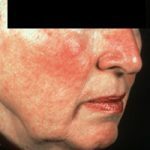 Though not well-researched, some people say that one or more of these factors make their rosacea worse: Heat (including hot baths) Heavy exercise Sunlight Winds Very cold temperatures Hot or spicy foods and drinks Drinking alcohol Menopause Emotional stress Long-term use of steroids on the face. People with rosacea and pimples may think the pimples are caused by bacteria. But no one has found a clear link between rosacea and bacteria. There is no cure for rosacea, but it can be treated and controlled. In time the skin may look better. A dermatologist (a doctor who works with diseases of the skin) often treats rosacea. There are several ways to treat rosacea. For skin: Sometimes antibiotics can be put right on the skin. Other times, oral antibiotics can be used. The skin bumps may get better quickly, but redness and flushing are less likely to improve. Small red lines can be treated with electrosurgery and laser surgery. For some people, laser surgery improves the skin without much scarring or damage. Patients with a swollen, bumpy nose can have extra skin tissue taken off to make it smaller. Usually patients feel this process helps their appearance. Some people find that green-tinted makeup is good for hiding the skin’s redness. For the eyes: Most eye problems are treated with oral antibiotics. People who get infections of the eyelids must clean them a lot. The doctor may say to scrub the eyelids gently with watered-down baby shampoo or an over-the-counter eyelid cleaner. After scrubbing, you should apply a warm (but not hot) compress a few times a day. If needed, the doctor may prescribe steroid eye drops. What Can People With Rosacea Do to Help Themselves? You play a key role in taking care of your rosacea. Here are a few steps to take: Keep a written record of when flareups happen. This can give you clues about what bothers your skin. Use a sunscreen every day that protects against UVA and UVB rays. Make sure it has a sun-protecting factor (SPF) of 15 or higher. Use a mild moisturizer if it helps. Don’t put irritating products on the face. If your eyes have problems, follow your doctor’s treatment plan, and clean your eyelids as told. Talk with a doctor if you feel sad or have other signs of depression. Some people with rosacea feel bad because of the way their skin looks.